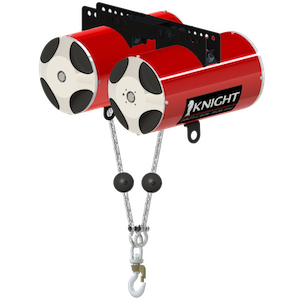 Knight’s Tandem Pneumatic Balancer Series is primarily designed for weights exceeding 700 lbs. [318kg]. Tandem pneumatic balancers are designed to provide the weight capacities of a reeved air balancer application, while simultaneously incorporating the extended travel benefits of a single pneumatic balancer. 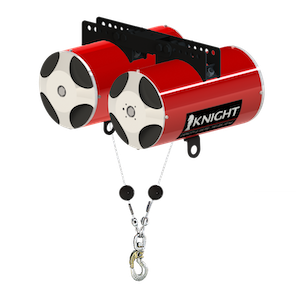 Our tandem chain balancers use a custom grade 80 lifting chain specially treated to increase the life of the chain by up to 300% over standard grade 80 lifting chain. Standard Travel: Up to 80 in. [2032mm].